Joomla Virtuemart Wallet System : This magnificent module has the concept of virtual wallet which holds some of user money online. User can make payment to the admin’s store using the digital cash stored in wallet instead of other payment option. 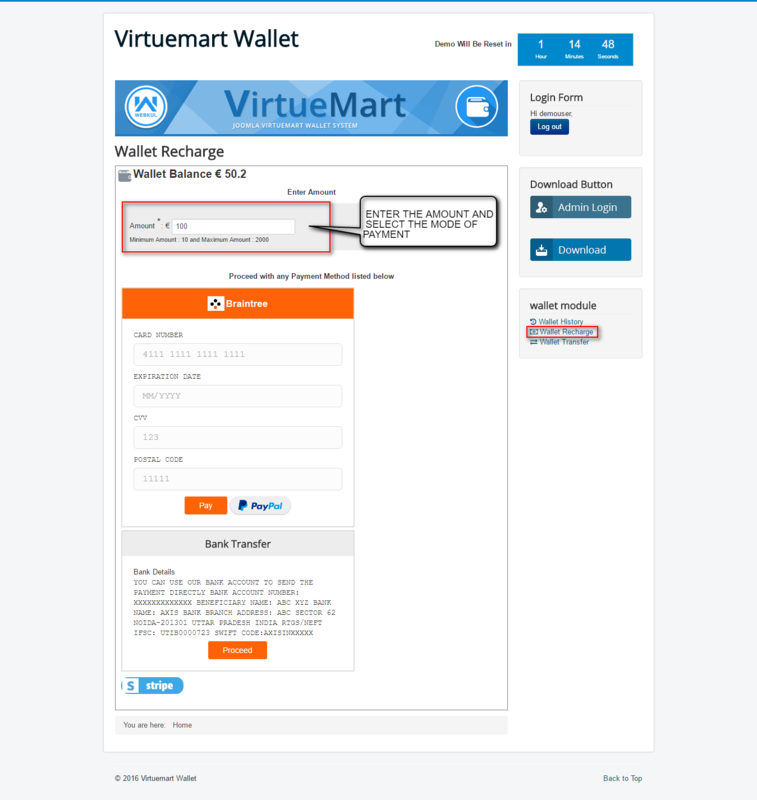 It is the in-built wallet for Virtuemart store. Admin can set minimum and maximum limit for Refund, Wallet Recharge and transfer limit. Support online and offline Payment Method for recharge. Wallet System supports cash transfer facility via mail address of registered store users. A separate tab has been provided to Admin to track the details of credit, debit and current amount status of wallet of individual user. Admin can refund cash to customer wallet. The refund cash will be added into the individual wallet. Compatible and well integrated with Joomla Virtuemart RMA product refund. Admin can set the status of order for which refund will be applicable. Customer/User can also check their transaction details. Customer/User can use their Wallet Cash as payment for buying any product. Customer/User can recharge their wallet anytime. Wallet recharge is possible via stripe payment gateway. Interactive interface for both Admin and User/Customer. 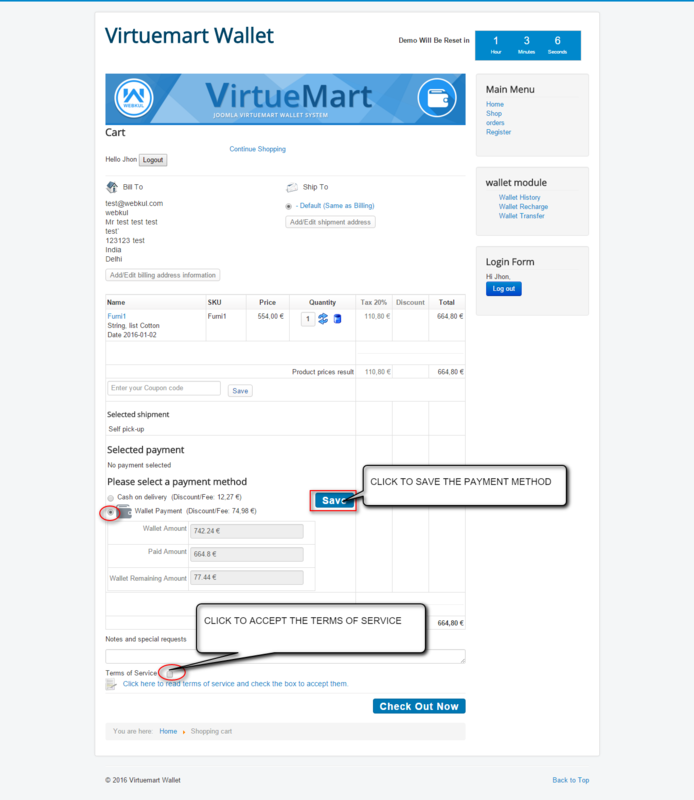 ** Note** Joomla Virtuemart Wallet System is well integrated and compatible with our Joomla Virtuemart RMA. User can recharge their wallet via Paypal, Braintree and Bank transfer along with Stripe payment method as per backend configuration. Functionality to integrate Alipay with Stripe and Paypal with Braintree is available. The add-on is working in Joomla version. Once installation is done successful , configure the Joomla Virtuemart Wallet System accordingly. Select “Yes” to allow wallet recharge for users of the site. Select “Yes” to allow money transfer between two registered users. Select “Yes” to allow refund of payment through RMA request. Allow refund through all payment methods by selecting ” All Payment Methods”. Allow refunds to orders placed using wallet money. The recharge of wallet can be done only via stripe payment. For that admin need fill the following parameters below. Select “yes” to enable Stripe payment for Wallet recharge. Select the payment mode of Stripe. Fill the credential of Stripe. Option to integrate Alipay with Stipe is available. Click “yes” to enable it. Set the header logo of stripe of choice by entering the image path. Enter title and description of the Stripe popup form. To enable Paypal click “yes” to allow Wallet recharge. Option to allow recharge via Braintree is available. Click “yes” to enable and select the mode of payment. Enter the credentials. Option to integrate Paypal with Braintree is available. Click “yes” to enable it. Wallet recharge via bank transfer is available. Click “yes” to enable it. Set the minimum and maximum recharge amount. In “Email Template” admin can set mail template on basis of pending, credit and debit of wallet amount. Set the parameters of wallet transfer configuration as follows. 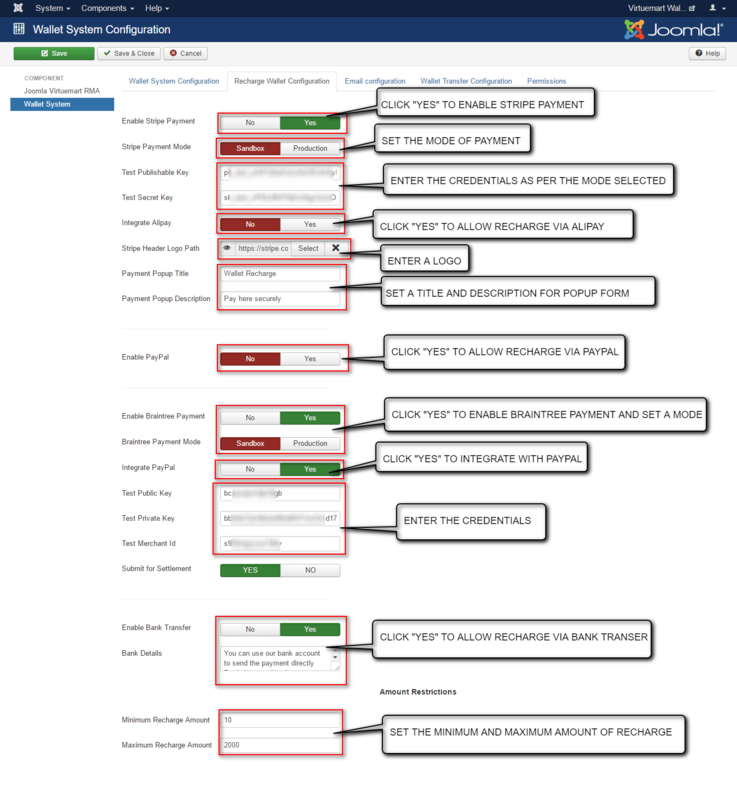 Select the status of order for which refund functionality will work. Set the minimum and maximum amount of wallet transfer. Admin can view the list of all wallet users of the store in the tab of “Wallet Users”. In the “Add Amount” tab admin can add wallet amount to specific user by entering the following parameters. Registered user name and email id. Amount that need to be added. A note for the user. Click “Wallet History” to view the transaction details of wallet. View of Wallet history as shown below in snapshot. Click here to recharge wallet. Enter the details as shown below in the snapshot. Enter the amount that need to be recharged. Click on “recharge” to recharge the wallet. Click on “Wallet Transfer” to transfer wallet amount to other registered user of the site. Enter the Payee registered email id for the admin site. Click on “transfer” to transfer the amount. In the cart page select the mode of payment as “Wallet” and save it. Accept the terms of service as shown below in the snapshot. Click on “Check now” to generate the order.